Leonard James “Jimmy” Hyatt, age 81, of Myrtle Creek, Oregon, passed away Friday, April 12, 2019, at his home surrounded by his family. He was born June 21, 1937 in Canyonville, Oregon, to Ed and Alice Hyatt. Jimmy, as his family called him, enjoyed hunting, fishing, family outings and get-togethers. He loved working on cars and kept them spotless. Jimmy also loved watching sporting events involving his children and grandchildren. Jimmy loved the Lord. He was always known for having a smile on his face. Jimmy retired from Hanna Nickel and went to work at Roseburg Lumber and retired in 2000. Survivors include his wife, Linda, and they would have celebrated 59 years on May 25th; daughters, Connie (Mark) Steen and Terri (Jason) Schuyler; sisters, Rose Peach and Loretta Clark; grandchildren, Lindsay Lewis, Michael Blankenship and Kim Wilcox; great-grandchildren, Blake Lewis, Fox Lewis and Desmond Wilcox. Jimmy was preceded in death by his parents, Ed and Alice Hyatt; brothers, Robert and Bernard; and sisters, Velma Fromong and Helen Staggs. Graveside services will be held Friday, April 19, 2019, at 2:00 p.m. within the grounds of Roseburg Memorial Gardens. Hospice Chaplain Andrew Sagayam will officiate. The family would like to thank Ruthie Greer, his hospice nurse, who took such good care of him. Please visit www.wilsonschapeloftherosesfh.com to leave the family fond memories and condolences. 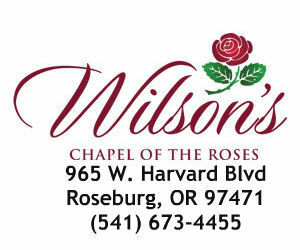 Wilson’s Chapel of the Rose is in charge of arrangement.